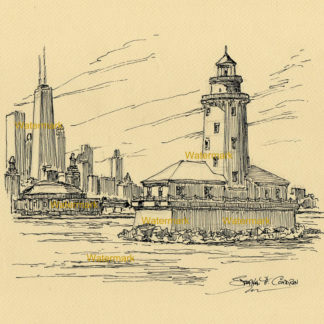 Lighthouse Art #142Y and prints • Condren Galleries Ltd.
Lighthouse Art #142Y is landmark artwork with JPEG & PDF scans and prints by artist Stephen F. Condren, BFA-SAIC, at Condren Galleries, a Fine Arts Gallery, which gives you low cost discount prices on all artwork, and is on sale now. Because lighthouse art is great, it’s prints are great! There are lighthouse all over the country and around the world. Many of these wonderful structures are inland along bays and lakes, and they are loved by all.